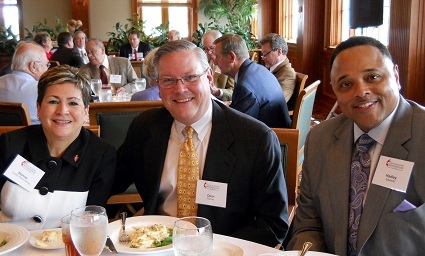 “Leaping Forward!” was the theme of this year’s Annual Meeting of the United Methodist Foundation of Louisiana, held April 23 at the Country Club of Louisiana. The meeting was a celebration and review of the Foundation’s latest programs to develop leadership for effective ministry among clergy and laity. Rob Fairly, president of the Foundation, and Chairman of the Board Irwin Felps led the meeting. Special guests included Bishop Cynthia Fierro Harvey and her husband Dean, Provost Don Cottrill and his wife Glennell, as well as several district superintendents and past board chairpersons. Specific Foundation programs mentioned included Leadership Excellence Advancement Program for pastors, Town & Country Ministry Academy to benefit the rural church, Advancing Pastoral Leadership program for young pastors, Call to Action Coaching program, and a series of leadership retreats with Dr. Gil Rendle for the extended cabinet members. Foundation board members continuing two year terms are: Irwin Felps, Chairman of the Board of Trustees; Rev. Joseph Awotwi, Vice-Chairman and Sandra Kuykendall, Secretary. Mike Dehart will continue as Investment Chairman, and those continuing their terms as Board members are: Rev. Weldon Bares, Mae Belton, L. Nettles Brown, James Goins, Frank Harrison, Michi Head, Sandra Kuykendall, Richard Lewis, Bill Potter, Alice Prophit, Larry Stafford, Fred Wideman.